I admit, pencil sharpeners drive me crazy. I love sharp pencils, they just work better. I have been using a lot of colored pencils lately, hand sharpeners do not work well. Electric sharpeners work, but you need electricity. So when Carol and I started classes workshops and Alaska plans. We needed a portable pencil sharpener. I a battery pencil sharpener from Staples, works great on graphite but not with colored pencils. Then I saw the Derwent battery Pencil Sharpener in A.C.Moore a local craft/art supply store. I was shocked by the $20.00 price. 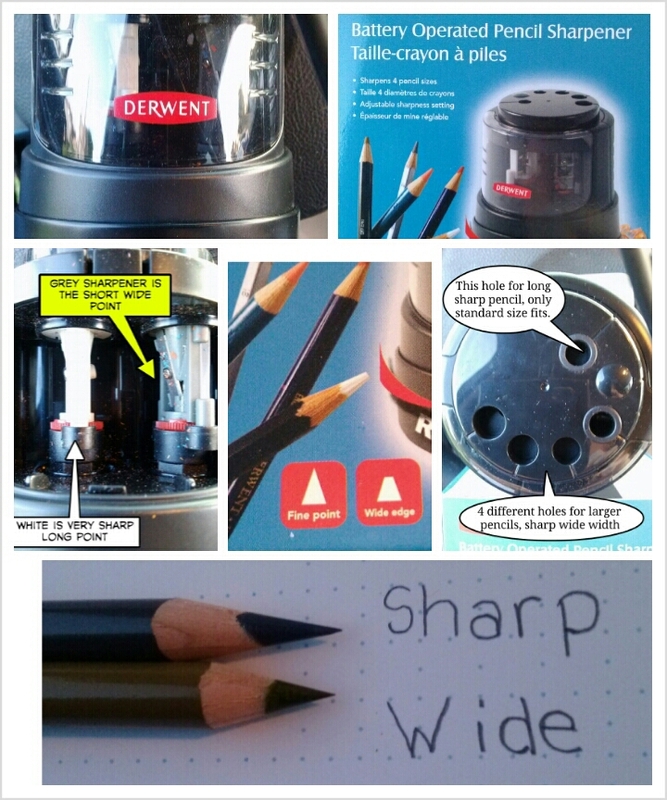 I decided to buy the Sharpener, mainly because of the Derwent brand and the make artist grade colored pencils. I am so glad I did. Sharp pencils in two different point choices(2 separate sharpeners). The base swivels so the sharpener tilts for ease of use. Transparent shavings window to see when full. Small size, solid base and Handsfree. Does not shimmy on table. Fairly quiet, pencil sharpeners make lots of noise.